ProActive Rail is a leading provider of temporary staff to Greater London area train operating companies. Its platform and customer-facing staff can be seen at stations, depots, stadiums, and more for clients like London Overground, Southwest Rail, and more. During busy periods, ProActive places as many as 1,000 workers across the United Kingdom, primarily focused in Greater London. 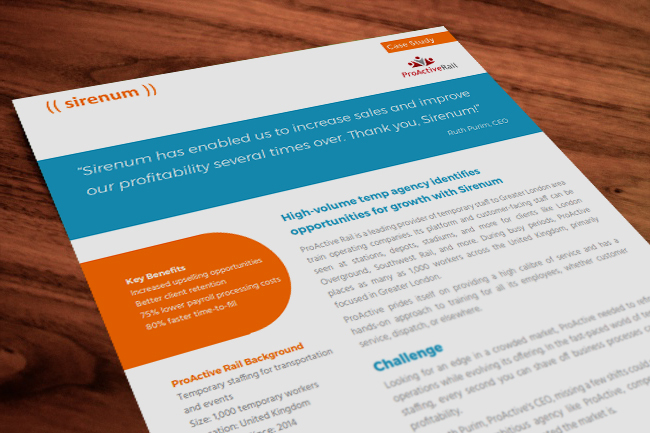 Fill in the form to download this Sirenum Case Study.